PENNY HAS NOW GONE TO A LOVELY NEW HOME IN SOUTHAMPTON! 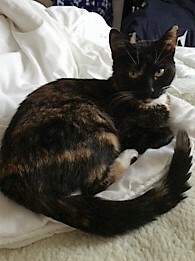 Penny is a 1 year old tortoiseshell, neutered female domestic shorthair cat. Penny came in to the rescue at Christmas as she had been handed in to a local vets as a stray. Sadly nobody came forward for Penny, so it is now time for her to find her forever home. Penny is nervous of new people, however once she gets to know you she really she is really affectionate, she loves to be stroked and cuddled. Penny does not like dogs and will tolerate another cat as long as it does not get in her face. Although Penny has shown no aggression towards young children, she is not relaxed in their company, so we would recommend homes with children 10+. Penny is just a baby and needs a home that will give her time to come out of her shell.